Munich - The Bundesliga's record foreign goalscorer Claudio Pizarro admits there’s still no definitive word on his future at FC Bayern München, even though he’ll be out of contract at the end of next month. bundesliga.com:, is today your last day at Säbener Straße? bundesliga.com: Your contract expires on 30 June and there's still no deal with Bayern over an extension. Pizarro: That's true, but the situation is the same as in the last two years: I signed an extension at the end of the season each time. Of course it's possible that I'll leave the club, but nothing's decided yet. bundesliga.com: Is there a realistic chance you'll stay? Pizarro: The club haven't decided yet, we still haven't discussed it. I've always said that I feel really happy here even though the last year hasn't been easy because I haven't played much. I'll only look at other offers if there's nothing on the table at Bayern. Pizarro: I haven't spoken to a Peruvian newspaper for two months... (laughs). But it's true that'd be tough. There's no better team than Bayern in Germany. Of course Bremen's always an option, I've played there before. I'm in no rush, though, and am not ruling anything out. First we've got a difficult game on Saturday, then we'll celebrate [winning the Bundesliga title], then I've got the Copa America. bundesliga.com: When you joined Werder Bremen in 1999, you surely couldn't have envisaged playing in Germany for 15 years. Did you have an idea of what the Bundesliga was like before you moved? Pizarro: Absolutely, I was an avid follower of the Bundesliga in Peru. Italian and German football were shown on the TV in my younger days. That's why I already knew so many Bundesliga players. bundesliga.com: So the move didn't come as a culture shock? bundesliga.com: But away from the pitch? Pizarro: Nothing shocked me, but of course it's a completely different culture here. Everything was new to me here. In Peru there isn't as much order and discipline. At first, my focus was only on football. In time I settled in away from the pitch. bundesliga.com: Would you do it all again? Pizarro: Yes, I think so. Moving to Germany was completely the right move for me. bundesliga.com: The Bundesliga's really come on during your time here. What changes have you noticed? Pizarro: Each year big players have moved to the Bundesliga and raised the quality. Bundesliga players are fitter than in other leagues, the tempo's faster here and the game's quicker. bundesliga.com: Nowadays is it more difficult or easier to score goals compared to at the start of your Bundesliga career? Pizarro: For me that's the only thing that hasn't changed (laughs). I have to put just as much into scoring goals as I always have. bundesliga.com: Mehmet Scholl said that you're the best footballer he ever played with. Who's the best you've played with? Pizarro: I've played alongside so many good ones, it's hard to say. But Mehmet was one of the best for me, too. He often looked for me and passed me the ball. I've got him to thank for plenty of goals. bundesliga.com: Is there an opposition player you particularly feared? Pizarro: I've come up against a couple of tough cookies. It wouldn't be right to pick one out, though. Luckily the best defenders were mostly on my team anyway (laughs). bundesliga.com: Is the current Bayern team the strongest team you've played in? Pizarro: That's difficult to say. We've got a strong squad with lots of good players, but we also had a really good team in 2006 with players like Michael Ballack, Ze Roberto, Robert Kovac and Hasan Salihamidzic. We could have won the Champions League back then as well. bundesliga.com: Bayern couldn't do it this season. Have they got it in them to win the Champions League next season? Pizarro: It's definitely possible with the quality of the players and the team. We haven't changed much since winning the treble a couple of years ago - good players have come in. Unfortunately at the end of the season we haven't been at our best and the important players have been injured. bundesliga.com: Do you still want to play for Peru again after the Copa America? Pizarro: I'll make that decision after the tournament. bundesliga.com: Have you set yourself a goal for the competition? Pizarro: It's not going to be an easy tournament. We have to get through the group stage, then we'll see. bundesliga.com: Have you already decided where you'll live when you retire from football? 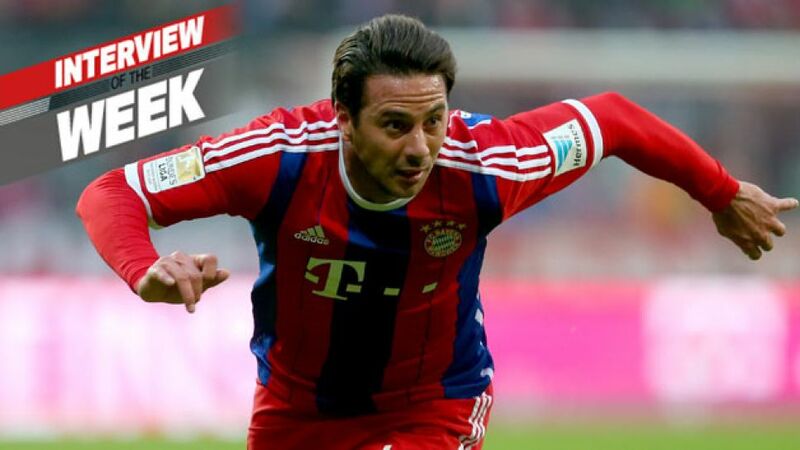 Pizarro: I'll stay with my family in Munich, we decided that together. If I end up moving to another club, we'll come back afterwards.